BIG Big Finish Week: Doctor Who - THE MARIAN CONSPIRACY Review | Warped Factor - Words in the Key of Geek. Tony Fyler turns conspiracy theorist. Who was the Sixth Doctor’s ultimate companion? Perpugilliam Brown, botany student and owner of the universe’s shortest pre-watershed shorts? Melanie Jane Bush, redheaded fitness-freak and dead ringer for that Bonnie Langford off the telly? According to Colin Baker, the Sixth Doctor himself, his ultimate companion never even made it onto the TV screen. According to Baker, the ultimate companion for the Sixth Doctor was history lecturer and older woman, Dr Evelyn Smythe, played by Maggie Stables. Over the course of more than a decade, Stables played Smythe back and forth along a timeline that grew increasingly complicated in the Big Finish audio range – not least because Big Finish found her so irresistible to work with, it was more than happy to continue to offer her stories even after the recording of her character’s death. The long and complicated journey of Evelyn Smythe begins right here. Buy it, play it, learn why she became so loved. As companions go, she broke most of the established molds. First, she really was a bona fide older companion, in the era before Wilfred Mott stepped aboard the TV Tardis – and indeed in the era before there was a TV Tardis. In fact, she could be said to have first proved the point that an older companion could work, and work brilliantly. Second, she brought an older person’s less melodramatic approach to the business of travelling through time and space – no screaming weakling, Dr Smythe. She channeled some of Barbara Wright’s passion for getting involved and meeting people, alongside a more robust attitude – faced with a gang of ruffians, she’d be more likely to stand them a round of drinks and make herself queen of the gang than she would be to get captured and be held helplessly at knifepoint for most of an episode. Third, she was the first made-for-Big-Finish companion. Before there was Charley Pollard, before there was Lucie Bleedin’ Miller, before there was even an audio interpretation of Bernice Summerfield, there was Dr Evelyn Smythe, the trailblazer for a new freedom in audio storytelling within an established universe. And finally, she absolutely didn’t blunder into the Tardis or the Doctor’s life by chance. In fact, in The Marian Conspiracy, which dates all the way back to 2000, she’s busy giving a history lecture at Sheffield Hallam University when the Doctor interrupts her. At this stage in his life, we’re very much dealing with the bluff, brash TV Sixth Doctor, before he’s had much of a chance to mellow either his personality or his outfit, and he’s waving his own equivalent of a detector that ‘goes bing when there’s stuff’ at her. She goes bing. She goes very much bing. There is most definitely ‘stuff’ connected with this otherwise generally unremarkable old history professor, who specialises in her own family history. The particular stuff the Doctor is tracking is a temporal nexus point which, he babbles, will essentially mean she won’t be specialising in her own family history for very much longer, because her own family history is unravelling as they speak. Naturally, if someone came up to you at work and said any of this, you’d think they were stark raving mad. Especially if they happened to be dressed like the Sixth Doctor and waving a box that went bing in your face. Evelyn thinks he’s stark raving mad. But when the Doctor says he’s going back in time to find the source of the nexus point, she can’t resist finding out exactly how mad he is, and she pretty much demands to be taken with him to see the period in question for herself. The period in question being the time of Queens Elizabeth and Mary, the contentious half-sisters with a penchant for court intrigue, religious bigotry and decapitating their enemies. The reason they go there is because Evelyn claims descent from a nobleman who was close to Queen Elizabeth, one John Whiteside-Smith. She claims he was later executed by Queen Mary. So far, so historical, except the Doctor insists that no such ancestor ever existed. See? Temporal nexus points – they can really mess up your day. In order to allow Evelyn to leave the Tardis’ rarefied environment in the Tudor period where the nexus point is located, she needs a doohickey clapped on her wrist, to stop her being affected by the rapid degradation of her family’s history. But with that proviso, the Doctor leaves Evelyn to go exploring in sixteenth century London, with a plan to meet back at the Tardis, while he goes to court. Sadly, they’ve misjudged the time slightly, and Elizabeth has yet to come to power. Mary’s still on the throne, and the Doctor, who expects to be welcomed into Elizabeth’s circle, has to think on his feet to establish trust with the legendarily sour monarch. It’s in these scenes that the stories ‘moral,’ if it has one, can be found, and it’s one the Sixth Doctor has revisited since, particularly in stories like The Holy Terrror – the power of legacy, and how we’re perceived for what we do. If we honestly believe we’re doing a thing that’s necessary and right, does history have the power to judge us? It’s easy in the abstract to say it probably doesn’t – but when the context is Mary’s religious war against Protestants, things become less clear-cut. It’s an argument more commonly rehearsed with the Nazis – if they genuinely, fervently believed what they were doing was right, is the unfailingly negative judgment of history valid? Told you it became less clear-cut. Do we judge the Dalek? Oh hell yes, just as we judge Nazis and slaughter-happy monarchs. The Sixth Doctor, when faced with such questions from the woman who believed Protestants could be brought to God by fear or by death, fudges an answer – think of your legacy while you’re alive, and aim for kindness. Meanwhile, Evelyn has fallen in with, if not a gang of ruffians, then at least a gang of murderously plotting Protestants and… well, you remember that thing about becoming queen of the gang? Without spoilering you too much, and pretty much as you’d expect, there’s at least one plot to murder the Queen (legacy, legacy, all is legacy…), the result of one of which is causing the temporal nexus point that’s eradicating Evelyn’s family from history. As for why it should be doing that – well, if you’ve heard of the grandfather paradox, you’ll understand that if you go back in time and kill your grandfather, you stop existing. If on the other hand, you go back in time and your grandfather’s got a plot to kill an axe-happy queen, and you discover it and tell the Queen before you realise your grandfather is actually your grandfather… it turns out you land yourself in pretty similar temporal hot water. Essentially, The Marian Conspiracy is a timey-wimey story before such a godawful phrase was ever coined, but it’s also a story about history, and how every life lived is tomorrow’s history, open to misinterpretation and judgment. A story about the legacy of our lives, and the weight of our beliefs and the actions to which they drive us. It’s a historical story with no real alien threat, but where, in slightly Sapphire and Steel style, time itself is something of an adversary. 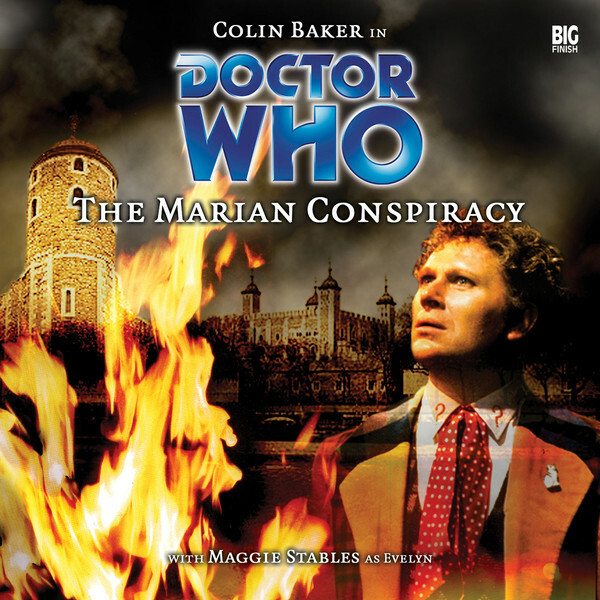 And while the slickness you’ll expect from Big Finish productions if you’ve listened to later titles is notably missing, once you start The Marian Conspiracy, you won’t turn it off until it’s done – if nothing else, if you do, you’ll lose track of the plots and sub-plots, of who wants to kill whom and why. But if you stick with it, The Marian Conspiracy shows Big Finish as a company with ambitious designs to tell complex, meaningful Doctor Who stories very early in its life. The Marian Conspiracy itself is also a must-listen because it’s the debut of Dr Evelyn Smythe, and she grabs the listener right from the very first minute, becoming over time the kind of no-nonsense companion who leads with a laugh, a compassionate heart, a sensible head and a really good lemon drizzle cake. Evelyn Smythe, like Maggie Stables, has become a legend in the world of audio Doctor Who. Go right back to the start of her legend with this complex, morally balanced tale of legacies and consequences, and how very little in this world is actually how it seems.